Pileje Digebiane facilitates digestion.In many situations: generous meal, unbalanced food, difficulty to digest, it can be necessary to help the organism to its digestive functions. The Digebiane tablet is composed of melisse, pineapple powder, calcium carbonate, sodium bicarbonate and papaya chosen for its capacities to help the digestion. 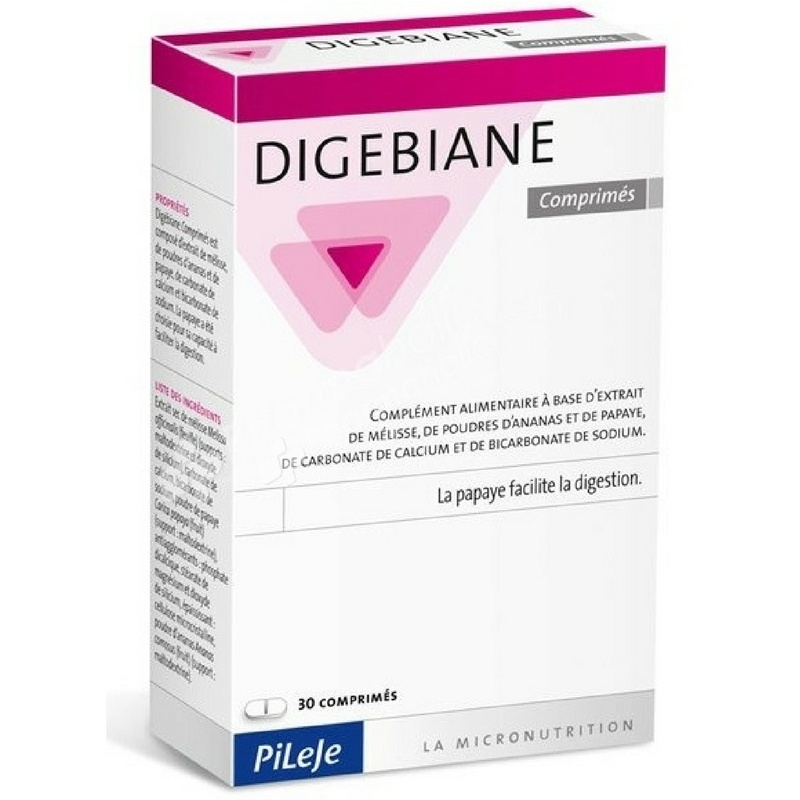 Pileje Digebiane Tablets aids digestion after a heavy meal or an unbalanced diet. This dietary supplement Pileje gives a boost to improve digestive comfort. Its plant extract of lemon balm, anti-inflammatory and analgesic, acts on digestive disorders with colic and bloating. This component stimulates bile secretion, the functions of stomach and intestinal contractions for easier digestion. Of pineapple and papaya are rich in digestive enzymes powder, promotes decomposition and digestion of proteins to minimize the signs of indigestion, gas and abdominal bloating. Coupled calcium carbonate sodium bicarbonate, antacid agents, the equilibrium pH of the gastric juice to form a gelatinous film dressing for the gastrointestinal mucosa. Take 3-6 tablets daily, during or at the end of the meal. Dry extract of lemon balm Melissa officinalis (leaf) ( brackets : maltodextrin and silicon dioxide) , calcium carbonate , sodium bicarbonate, Carica papaya powder Papaya (fruit) (carrier: maltodextrin ), anti- caking agents: di-calcium phosphate, stearate magnesium and silicon dioxide , Thickener : microcrystalline cellulose, powdered pineapple Ananas comosus (fruit) (carrier: maltodextrin) .